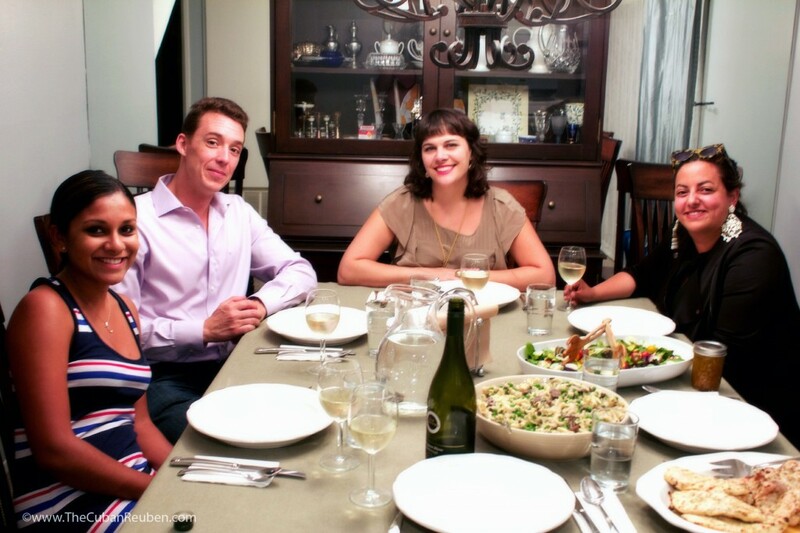 A few weeks ago, Kenny and I were invited to our friends’ house for Shabbat dinner. This is a big deal, because often times our friends get nervous about inviting me, the in-house foodie, to eat their home-cooked food. The truth is, as much as I love cooking for others, I also appreciate when others cook (or order in) for me! It’s really a treat, and this particular dinner was no exception. Leading up to the occasion, we were teased with promises of an old family recipe for Russian short ribs, which Irene paired with creamy, stick-to-your-ribs polenta. Yes, the short ribs most certainly lived up to the hype, as there may or may not have been a moment where all four of us bonded over sucking on the bones after the meat literally slid off. Even when there was no meat left, we tore pieces of my challah to mop up any remaining sauce. That’s how good it was. And yes, home-style polenta was certainly the perfect choice to accompany such a decadent and special dish. But those tasty eats aside, I must admit that the true dark-horse dish of the evening was a simple salad Irene prepared, that was topped with a homemade dressing. 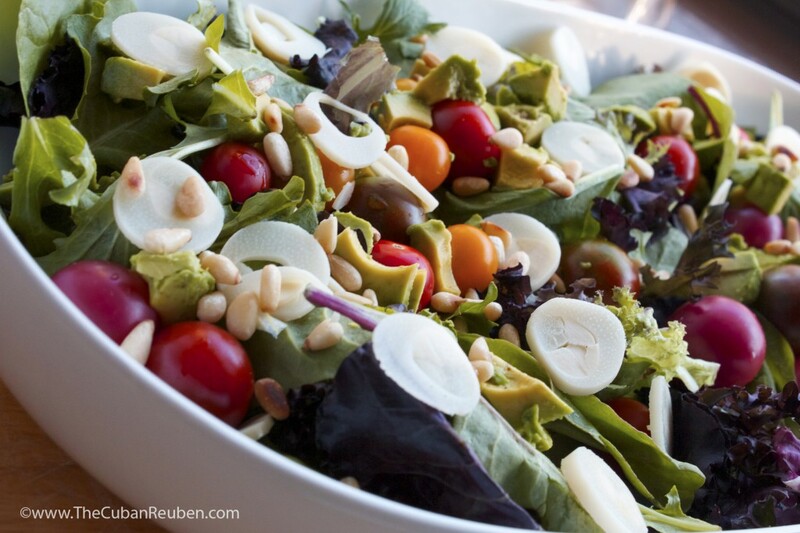 Pre-dressing, my salad included spring mix lettuce, sliced hearts of palm, baby heirloom tomatoes, toasted pine nuts, and chunks of fresh avocado. I know it seems hard to believe that when compared to short ribs and polenta, the star of the evening would be dinner salad, but trust me on this one, as it was all in the dressing. 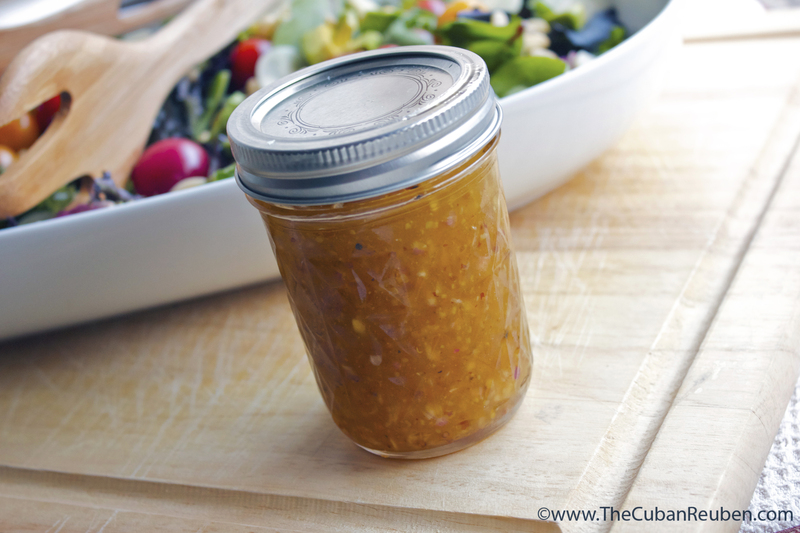 I will always favor a homemade dressing to the jarred stuff you can get at the store, particularly because they are so easy to make. Irene combined a handful of both savory and sweet ingredients, like real maple syrup and dijon mustard, that so perfectly heightened her choice of salad mix-ins, and for several days after our dinner, I was still thinking about it. This is why, when I planned the next dinner party Kenny and I hosted, I knew exactly which salad dressing to feature. 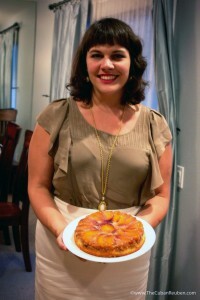 Rachel, sporting her mighty peach upside-down cake. As my guests arrived with their pot-luck offerings in tow, I quickly shook up the ingredients of the dressing in a small mason jar, and placed the jar alongside the salad on the dinner table. It was really that easy. After a quick photo for good measure, we chowed down on dinner, and before we knew it, there wasn’t a morsel of lettuce left of the salad to speak of. Dinner guests, anxiously awaiting the photo, so that they can start eating! It looks like I’m not the only fan of Irene’s famous dressing! Next time you’re in the mood for whipping up some homemade dressing, give this one a whirl. Or a shake, for that matter. It may be the je ne sais qoui to kick up your favorite salad just a notch. Kick up your salads a notch with this easy, homemade dressing recipe. Combine all ingredients in a lidded jar, seal tightly, and shake vigorously until oil has emulsified and everything is well-incorporated. Chill until right before serving. Irene also suggests trying flavored balsamics, like peach or fig, for this recipe. 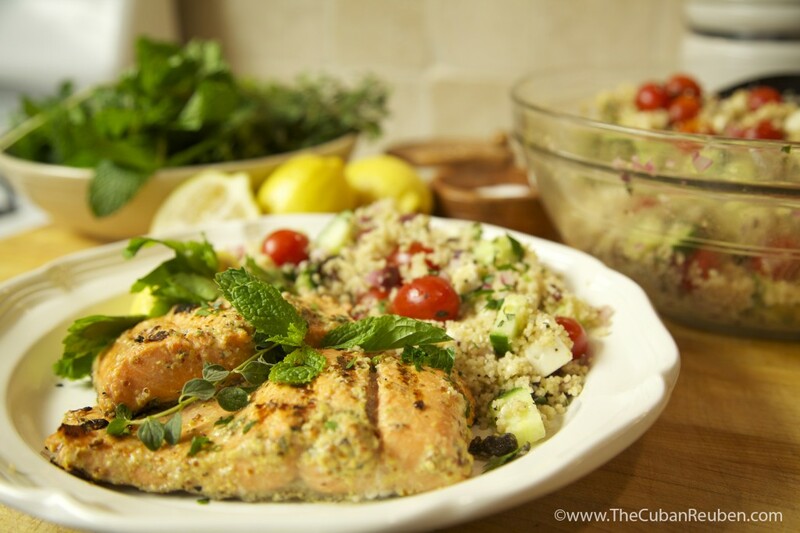 On the third episode of Office Eats, I made grilled salmon filets accompanied by a Greek-style couscous salad. I’ve written about my luke-warm love affair with fish before, and salmon in particular is one of the greater offenders. However, since I figured out a way to make it not only palatable, but actually enjoyable, I thought I’d share. This recipe is very similar to one I featured a little over a year ago, but this one has an extra key ingredient that takes it to a whole new level. Not to mention that it’s prepared using my cooking method of choice: grilled. The real secret to it’s taste bud success is that I’ve paired it with a side dish that is so full of flavor that if you’re lucky enough to get a flake of fish and a few pearls of couscous in the same bite, you’ll understand why these two dishes are a match made in heaven. On film shoot day, the crew was happy to finally reach this recipe, because not only did it mean we were halfway through the call sheet for the day, but it signified that we were that much closer to taking our lunch break. Since this was a bonafide production, our production assistant, or PA, fulfilled both a coffee run (I know, I know, but we started really early in the morning), as well as a mad rush for our lunch. You know it’s a sanctioned production when you break for lunch. Trust me on this one. By the time our PA dutifully jotted down our lunch orders, Kenny, who was upstairs studying the entire time, hadn’t yet come down for a breather, and I was beginning to suspect that he might be getting hungry. Given that we had a date-night scheduled for that evening, I earned my good-wife-stripes early, when I specifically ordered a lunch I knew Kenny would enjoy. He was pleasantly surprised when our PA returned with lunch, and I invited him to join the crew as we chowed down. Little did he know that I was actually more interested in feasting on the fruits of my Office Eats labor than any of the restaurant options. And now, for your viewing pleasure, click here for episode 3 of Office Eats, from Relativity Media’s #COIN. This perfect pair will satisfy fish lovers and haters, alike! 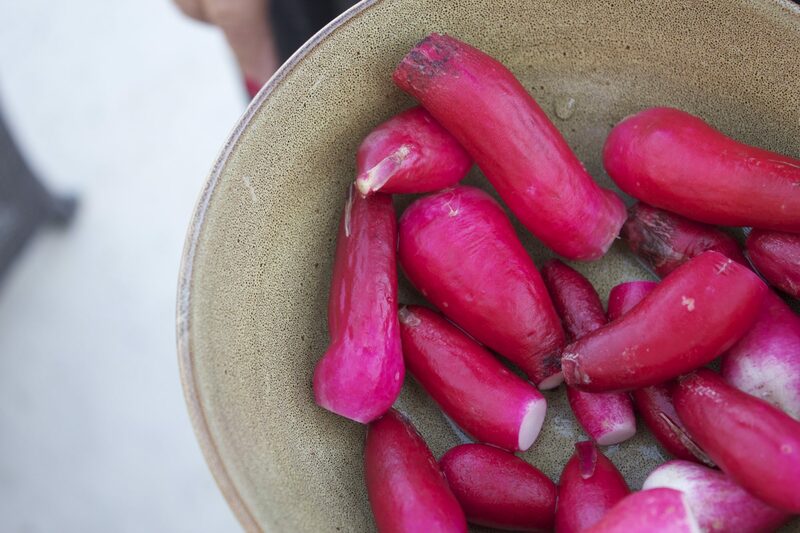 Place red onions in a small bowl, and cover with red wine vinegar. Set aside to soak. In a small saucepan, bring chicken stock and 1 Tbs. olive oil to a rapid boil. Add couscous, stir, cover, and turn off the heat. Set aside for 5 minutes. Meanwhile, in a large bowl, combine cucumber, oregano, mint, tomatoes, cheese, olives, salt and pepper. Once the couscous has steamed and absorbed all the liquid, fluff the couscous and add to the bowl with the other ingredients. Stir in the red onions and a few teaspoons of the red wine vinegar. Add remainder of the olive oil, and stir to combine ingredients. Serve immediately, or refrigerate for later. Place filets in a large plastic bag. Add in mustard, garlic, oregano, the juice and zest of 1 lemon, and the olive oil. Close the bag, and massage all the ingredients into the fish. Set aside to marinate for 30 minutes. Heat your grill (or grill pan) to medium/high heat, spray with cooking spray, and grill fish, skin side down first, for 3 minutes per side. Place the fish on plate, and garnish with Italian parsley and fresh lemon juice.